Circling the Sun by Paula McLain had been sitting in my wish list in RiverShare OverDrive for a few months before I decided to give it a listen. The plot grabbed my interest, but every time I scrolled through my list to find a new book, I never picked it because the cover wasn’t appealing. Well, I finally decided to read it when I discovered that our Info Café Blog’s Online Reading Challenge had Kenya listed as the country for May. Circling the Sun takes place in Kenya! It was a win-win. Now that I’ve finished it though, I wish I had started reading this book a lot sooner. 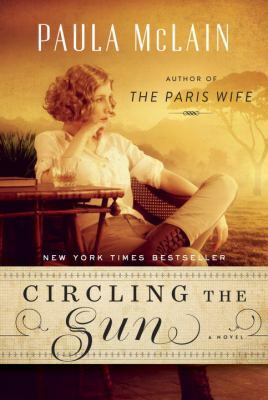 Circling the Sun tells the story of Beryl Markham, a real-life record-setting aviator who lived a life of adventure full of strife and unconventional desires. She was born in England and then brought to Kenya by her parents because her father wanted to farm, despite the fact that he had no experience doing so. Her mother left her and her father in Kenya when Beryl was very young to move back to England. As a result, Beryl was raised in a very unconventional way by her father and the native Kipsigis tribe who worked on her father’s estate and lived close by. Growing up without what the English considered to be a ‘traditional’ female role model, Beryl because a bold young woman who was not afraid to share her opinions, to try new things, and who understood the balance of nature, something that her father passed down to her. Once Beryl reached a certain age, her father decided that she needed to have a more traditional life and thus threw the cozy life Beryl is familiar with into utter chaos. Her relationships began to dissolve and she was left floundering and confused about what exactly she was supposed to do with her life. Taking the skills she learned from her father as a horse trainer, she decided to become the first woman horse trainer in Kenya, which of course proved to be a very tricky process. Her decision to become a horse trainer led her more deeply into the European Expat community in Africa where she met and became entangled in a messy love triangle with safari hunter Denys Finch Hatton and Karen Blixon, who was the author of the classic memoir Out of Africa. Their tangled relationship and Beryl’s continuous desire to try more, to do more, and to be able to fend for herself leads her to journey all over the world and to meet many remarkable people. 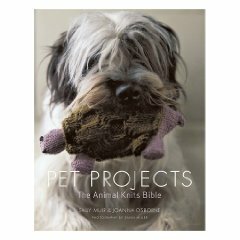 I thoroughly enjoyed listening to this book, but I did find myself confused sometimes about who different characters were referring to. I know this was probably because I listened to the book and missed seeing the names in print, but I still was able to figure it out at the end. I also highly encourage you to listen to/read the epilogue where the author gives readers a glimpse into the real life of Beryl Markham and what happened to her, her friends, and family after the book ended. 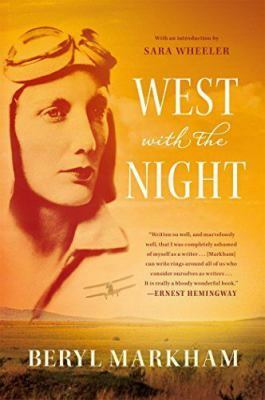 The author also mentioned the book West with the Night that Beryl Markham actually wrote! She praised it highly and Ernest Hemingway even reviewed it with his quote directly on the cover. This book is on my to-be-read list and I can’t wait to read more about Beryl’s life from her own point of view. November 1958: the National Horse Show at Madison Square Garden in New York City. Into the rarefied atmosphere of wealth and tradition comes the most unlikely of horses-a drab white former plow horse named Snowman-and his rider, Harry de Leyer. They were the longest of all longshots – and their win was the stuff of legend. 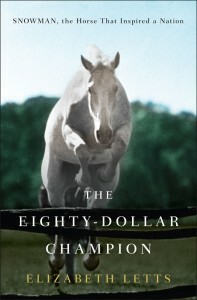 The Eighty-Dollar Champion by Elizabeth Letts tells their extraordinary story. Harry de Leyer first saw the horse he would name Snowman on a bleak winter afternoon between the slats of a rickety truck bound for the slaughterhouse. He recognized the spark in the eye of the beaten-up horse and bought him for eighty dollars. On Harry’s modest farm on Long Island, the horse thrived. But the recent Dutch immigrant and his growing family needed money, and Harry was always on the lookout for the perfect thoroughbred to train for the show-jumping circuit-so he reluctantly sold Snowman to a farm a few miles down the road. But Snowman had other ideas about what Harry needed. When he turned up back at Harry’s barn, dragging an old tire and a broken fence board, Harry knew that he had misjudged the horse. And so he set about teaching this shaggy, easygoing horse how to fly. 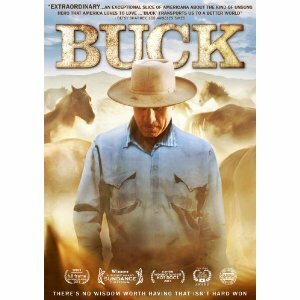 By turns humorous and heart wrenching, the documentary Buck is far more than it first appears. Sure, it’s about horses and how to treat them, but it’s also about people and facing adversity and being the best person you can, no matter what you’ve faced in the past. Buck Brannaman (who was the inspiration for and consultant to the movie The Horse Whisperer and even worked as Robert Redford’s stunt double) travels across the country giving workshops on “Natural Horsemanship”, a method of training horses that rejects cruelty and “breaking”, and instead teaches understanding and finding mutual benefits for both horse and rider. People often bring “problem” horses to Buck, horses that refuse to be saddled or follow commands; invariably Buck has the horse calm and obedient within minutes, all done with gentle, persistent direction. Buck points out that most of the time the problem lies with the rider; he doesn’t treat people with horse problems, he treats horses with people problems. What’s most riveting about Buck though is Buck Brannaman himself. Raised by a tyrannical father that regularly beat and abused him and his brother, Buck has actively chosen to leave that legacy in the past. He has an empathy for horses – and people – that only someone that has known what it’s like to be afraid and helpless can have. He’s found that the way that he’s learned to treat horses – by giving them a chance – bleeds into your life and how you treat your fellow humans. Buck is exactly the kind of person you’d like to invite over for barbeque and a beer – funny and smart and thoughtful, a true modern cowboy. This documentary is beautifully photographed and edited. Buck’s story informs the film, but doesn’t overwhelm it. And despite the past suffering, what you’ll remember and feel is hope for the future. For most people, horse racing only appears on their radar in May when the Kentucky Derby is run, or maybe later in the summer during the Triple Crown races. These races showcase the stars of the sport – incredibly valuable, highly trained athletes, supremely talented and owned by the very wealthy. In the real world, the majority of the sport is in action year round, mostly on smaller, lesser known tracks, populated by work-a-day horses earning a living on a smaller stage. Racing can be hard on a horse, and their career is often limited by injuries and age – a racehorse is considered old at 7 or 8 years old. What happens to these horses when they can no longer race? Many make a career change to polo ponies or jumpers, or as riding horses but there’s always the danger that they’ll end up in slaughter pens or with an inexperienced or abusive owner. Matching up the right personality and ability to the right owner takes patience and understanding and this is where Lynn Reardon steps in. In 2002 Lynn created the non-profit LOPE (LoneStar Outreach to Place Ex-Racers) on her small ranch in Texas. Hundreds of Thoroughbreds have come through the ranch for retraining, rehabilitation and a chance for a new life. Lynn is no blue-blood, but a hard-working escapee from cubicle-land who didn’t learn to ride until she was an adult and who scrapes for donations and advice for her organization. 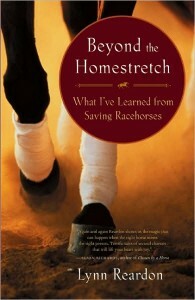 Beyond the Homestretch is her story and the stories of the horses. Full of humor and insight and peopled with the unique characters that make up the world of racing, this is a can’t-put-down book. Never sentimental, Lynn describes the unique histories and personalities of each horse – their humor, their fears, their courage, their intelligence. And even as Lynn saves their lives, the horses become her best teachers and save her in return. Be sure to visit LOPE’s website where you will find lots of extras including pictures of many of the horses featured in Beyond the Racetrack, a list of horses awaiting adoption and information about the ranch and the program goals.